Margaret I'm Margaret Chayka, a single, middle-aged gal in the Twin Cities, Minnesota area with one precioussss daughter and two cats. In 1998 I decided to become a personal chef, and since my first passion was doodling and drawing, it was a pretty natural transition to graphic design with the professional foodie in mind. It all started in 2004 when I produced a custom logo for an online chef acquaintance and I just spread the word. In those early days I was just using Powerpoint! Margaret The perfect storm leading up to my Zazzle store was a company layoff, a desire to abandon Cafepress, and a switch from custom to 100% pre-made logo and graphic design. I started Chef Catering Biz Cards in late June of 2009 while I had time on my hands. 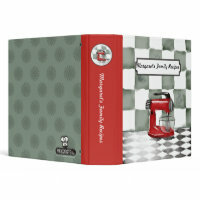 Margaret I recently decided to shift my existing Culinary Note Cards store at Zazzle to a 100% Christmas shop for foodies: holiday cards, "from my kitchen" stickers and tags, and tree ornaments. I sell a lot of culinary Christmas cards, at Zazzle and elsewhere, to produce sellers, kitchen design companies, cooks, bakers, you name it. In August, 2010 I opened up a new store called Events and Holidays which will contain gifts and stationery for everything from birth to...well, you know. Margaret This binder is totally popular, and it's no wonder why. A watercolor style single red stand mixer, with nifty checkerboard and diamond tile in sage and charcoal. From Culinary Note Cards and beyond, my top seller for 2009 was this charming snowman chef with snowball platter; I design a new snowman every year. Margaret That turns out to be very little time! I'm crafty as well - I sew handbags and am working on a Wordpress to sell them on. I don't like the restrictions of online "craft sellers" sites, and if you goof off instead of sewing, they turn your store off! I also love - when I have the time - to play video games and go to the movies. If it can be killed or blown up, I'm all over it, hee-hee! Margaret I'm pretty much a workaholic, and my daughter's grown up and family is spread out all over the place, so I'm pretty much a free agent. I have a full-time job, but it doesn't start until 9:30, so as an early riser I get in a good 4 hours of designing before heading out to the rat race. Margaret About 6 months. I was surprised by all of it, since my experience at Cafepress was quite different. I made my first sale quickly, too, which was astonishing. Margaret I can't say that I know any secrets - I design a lot of stuff, so uploading my designs to Zazzle is fairly regular; most of my sales come from the marketplace so I make sure my keywords are descriptive and target my market. I make announcements on Facebook, then it auto-loads to Twitter, but my blog suffers from neglect on a very regular basis! Since my Events and Holidays store will cover a larger market, there will be a need to buckle down on more marketing, but I'll see how it goes.